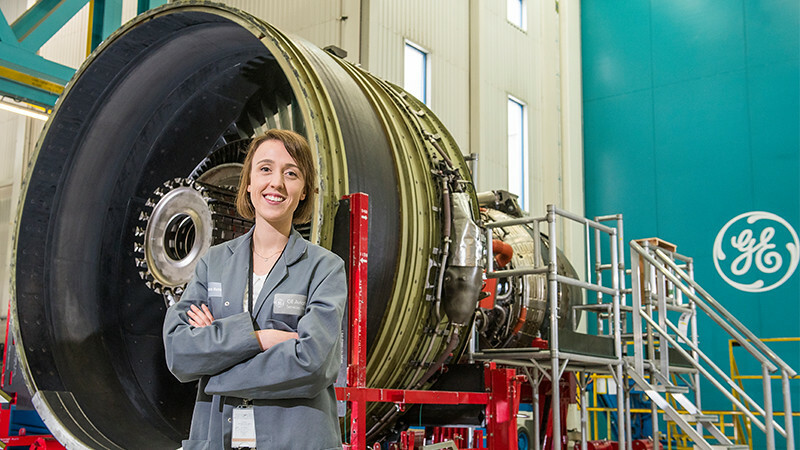 Alice Richardson worked as a Quality Control Intern at GE Aviation Wales for her placement year. GE Aviation services and repairs commercial aircraft jet engines in line with strict aviation regulations. I am working in the department responsible for ensuring that all procedures and practices are followed. We do this through regular quality walks, weekly meetings with managers and metrics on complaints and losses. I have been assigned as the Quality Engineer for the Shared Services and Materials departments. This covers the cleaning section, non-destructive testing, bearing and blade inspection, as well as the stores, accumulation areas and receipt area. I've developed my communication and presentation skills by holding a monthly quality forum for my department to discuss issues and highlight best practice. I've really enjoyed the opportunity to view engines in different states of assembly or repair. Through this I've increased my knowledge of engine parts and their operation. I have also improved my problem-solving skills by investigating how parts have become damaged through incorrect tooling use or mishandling. The experience of working for a world-class company in an industrial aviation environment will hopefully improve my employment prospects and benefit my studies. My placement has provided me with a greater awareness of engineering within business and the variety of opportunities that are available to graduate engineers. When I graduate I would like to return to working in the aviation sector and explore the prospects within project management.